This is a typical original sweet for the commemoration of the dead and for Christmas, but today it’s available in any season. 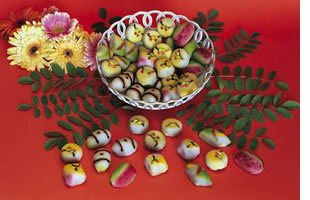 It is the typical almond paste mostly used to make fruit-shaped sweets. 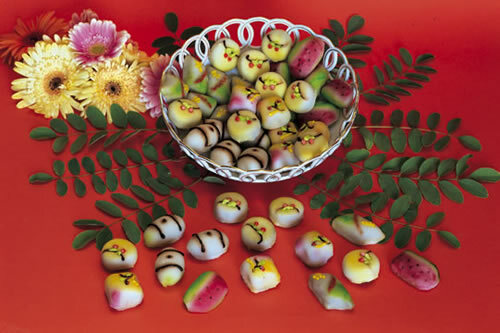 The tradition tells that these sweets, or fruit, were invented by the Benedictine nuns from Martorana Monastery in Palermo, which in the Middle Ages gained an important reputation for these coloured creations indeed, which would then take the name of “Martorana’s fruit”. Many other sweets are prepared with almond paste even if they have a different shape than fruit: like the “picureddi” (small sheep), to be found anywhere for Easter; small horses and donkeys in Acireale for St. Anthony’s Day (27th January), and piglets in the Palermo area for St. Sebastian’s Day (20th January). Melt slowly 530 g of sugar with half a glass of water, and as soon as it starts to spin pour in the almond paste (800 g of raw almonds crushed up to flour texture); then add 100 g of manioc/cassava flour. Still blend on a slowly and cook up until the dough is very thick, almost hard, in order to remove it all together at once. Let it cool, knead, put in moulds with the chosen form and then colour it if you want to reproduce fruits or objects. Variations: another quantity requires, by using the same technique, 1 Kg of sugar, 2 spoons of water, 1 Kg of almonds, 200 g of flour, 10 g of cremor tartaro. One more: 450 g of sugar, 2 spoons of water, 400 g of almonds and 300 g of flour. One last one: 1 and ½ rolls of sugar (1,200 Kg); 1 and ¼ rolls of almond flour (1 Kg); 2 and ½ ounces of water (625 g). Cook water and sugar up until the sugar “threads”; add, mixing well, the almond flour and the vanilla and then carry on as with the recipe.